MMorse Writes! : MMorse on Bright Wall/Dark Room! MMorse on Bright Wall/Dark Room! This summer I was honored to have a piece of mine published in Bright Wall/Dark Room, an online magazine that I really admire for their focus on thoughtful, long-form writing about film and TV. 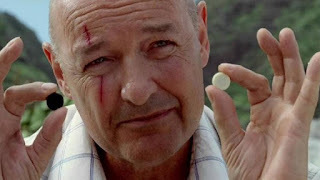 For their issue on "The Hero's Journey" I wrote a piece on John Locke - the single best character on what is, for me, one of the most ambitious and most exciting television shows ever created: LOST. That piece, on the dark side of the Hero's Journey, can be read right here. I hope it's enjoyed! Welcome to MMorse Writes! - a resurrected home for the various-and-sundry scribblings of MMorse, author of the upcoming book "Speaking Backward: Exploring the Themes and Mythology of Twin Peaks." I encourage you to bookmark and/or join this blog, and to contribute your comments and your thoughts. They are always read, and always appreciated. If you'd like to get in touch with me for any reason (lucrative writing assignments, offers of free swag, pop culture recommendations and invitations to affairs of state are all encouraged), you may do so at mmorsewrites@gmail.com. Follow Me Needlessly On Twitter! Visit My Author Archive on Chud.com! MMorse is a comforting fiction. Copyright MMorse 2010 - The Inevitable Heat Death of the Universe. Simple theme. Powered by Blogger.